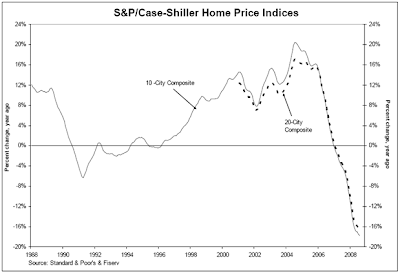 Inquiring minds are considering the S&P/Case-Shiller Home Price Release for October 2008. New York, October 28, 2008 – Data through August 2008, released today by Standard & Poor’s for its S&P/Case-Shiller1 Home Price Indices, the leading measure of U.S. home prices, shows continued broad based declines in the prices of existing single family homes across the United States, a trend that prevailed throughout the first half of 2008 and has continued into the second half. Once again, the indices have set new records, with annual declines of 17.7% and 16.6%, respectively. However, the acceleration in decline was only moderate in August. The July data reported annual declines of 17.5% and 16.3%, respectively. “The downturn in residential real estate prices continued, with very few bright spots in the data,” says David M. Blitzer, Chairman of the Index Committee at Standard & Poor’s. “The 10-City Composite and the 20-City Composite reported record 12-month declines. Furthermore, for the fifth (5th) straight month, every region reported negative annual returns. Nine of the 20 regions have record annual declines. Phoenix and Las Vegas are now returning -30.7% and -30.6% versus August 2007, respectively. Each of the California markets- Los Angeles, San Francisco, and San Diego- are down more than 25% from their values 12 months ago. Miami and Tampa, the two Florida markets, are down 28.1% and 18.1%, respectively. The following charts were produced by my friend "TC" who has been monitoring Case-Shiller Data. Although individual cities topped at varying times, the top-10 and top-20 city composites peaked in a June-July 2006 timeframe. "TC" writes: I've included data available from the CME Futures market so your viewers can see when people are betting the downturn will end and how much lower it will go. The CME Futures market only trades the top 10 cities. The Futures Data shows projected price declines and the projected trough. Housing data continues to weaken around the country and the futures market continues to point towards 2010-2012 prices as a market bottom. 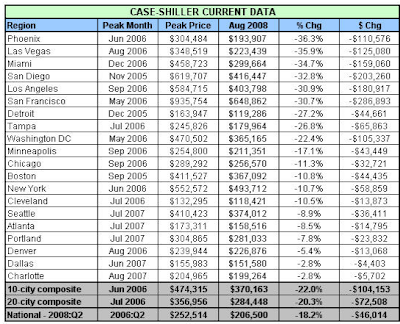 Those declines would represent a 30% - 50% drop in the top 10 metro cities tracked by Case-Shiller. "TC" also monitors the California Association of Realtors (C.A.R.) data, and DQNews data. Inquiring minds may wish to take a look at C.A.R. Median Home Prices Down 47% From Peak for a detailed look at home prices in California. 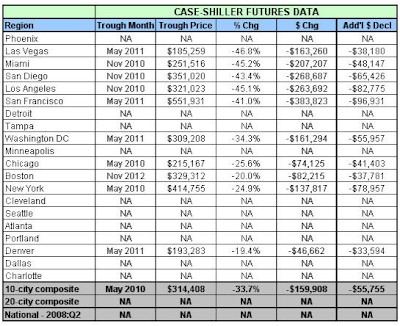 All measures of home prices (NAR, Case-Shiller, OFHEO, etc.) overstate price increases and understate price decreases. The reason is prices are not "maintenance" or "improvement" adjusted. What does this mean? Well take my neighbor on my cul-de-sac for example. According to the official sales logs he bought the house in July 2005 for $395,000 and sold in August 2008 for $305,000. This was a smaller than usual decline for this area (-22.8%). What isn't seen is that during the 3 years he owned the home he replaced the AC unit, the entire roof, added a swimming pool and added 300 square feet to the dwelling. These types of improvements are never captured by NAR, Case-Shiller and OFHEO. And consequently, it appears the price decline was only 22.8% rather than the "typical" 40% - 45% we are experiencing throughout town.